Buffalo Technology's MiniStation Thunderboltâ„¢ Portable HDD is world's first portable Thunderboltâ„¢ with an USB 3.0 dual-interface external drive solution. The Thunderboltâ„¢ (10Gbps) Interface is twice times faster than USB 3.0 while preserving backward compatibility with existing devices that support USB 2.0 or USB 3.0. The MiniStation Thunderboltâ„¢ Portable HDD can be formatted to support both PC and MacÂ® making it a great portable storage solution for any device. Native Compatibility with Mac OS X Time Machine also makes it an ideal solution for backup with Mac computers. Bus-powered, the MiniStation Thunderboltâ„¢ Portable HDD requires no additional power supply and is easy to carry. Just plug the portable HDD body with the included Thunderbolt Cable* onto your Mac. Housed in a sleek aluminum body with a transparent frosted top, the design feels luxurious. MiniStation Thunderboltâ„¢ Portable HDD features an indirect disk access LED indicator on the underside that tastefully illuminates its supporting surface. 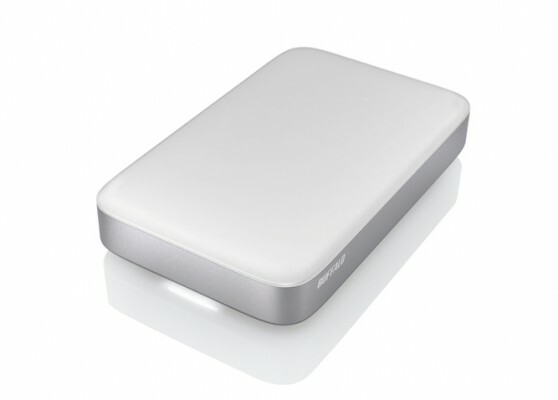 With the MiniStation Thunderboltâ„¢ Portable HDD on the move, you can transfer digital content faster, simplify connections between devices, maintain compatibility with nearly any device and enjoy new ways to use portable storage.